NXE2000PMIC optimized for High-performance Smart devices requires Quad to Octa core AP – Nexell Co.,LTD. NXE2000 is the power management IC for GPS-PND/MID and Smart devices. 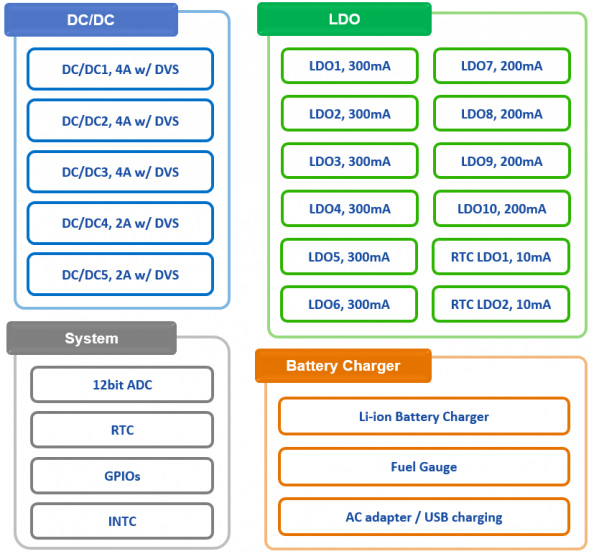 It integrates five high-efficiency step-down DCDC converters, twelve low dropout regulators, power control logic, Li-ion Battery Charger, I2C Bus interface, voltage detections, thermal shut-down and etc. • Supports AC adapter charging and USB charging in an individual port. • With the current limit protection and charge current control. • The system can power on even when Li-ion Battery is low voltage or open. • Rapid timer and Trickle timer.